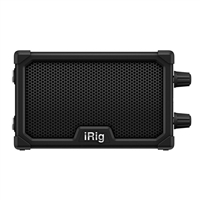 Rig Nano Amp combines the circuitry from IK's top-selling iRig 2 interface with a miniature but powerful 3W amplifier for the ultimate portable mini amp solution. Players can use iRig Nano Amp as a standalone practice micro amp, or connect their iOS or Android compatible device and use it as a interface to play, practice and record on their device. With a 3 speaker and 3W class B amplifier, iRig Nano Amp lets you connect a guitar or bass for low-level rocking. Totally battery powered, it offers a 1/4 instrument input and British- emulating tone stack with pre and power-amp gain controls, and a built-in stand for ideal positioning. If that is not enough, it can also be used as a micro-amp head to connect directly to a regular speaker cabinet (up to a 4x12) for a brit-driven sound to rock out big. But the real magic of iRig Nano Amp is the built-in iRig circuit, letting players connect their instrument to an iPhone or iPad for use with apps like AmpliTube. Now they'll have an entire rig of famous guitar amps, pedals, effects and more, along with backing tracks, looper, drum machine and multi-track recorder, all running seamlessly through an amp that will fit in a guitar case. When used with an iOS device an headphone output, it also provides silent playing and practicing.